Organize Your Money and Track Your Progress! Today's card-swiping culture has left many over their heads in debt, feeling totally out of control. The envelope system is a key component of The Total Money Makeover plan because it works. Try this simple way to manage your household income and expenses and avoid spending more than you make! It’s got eight spiral-bound cash management envelopes. 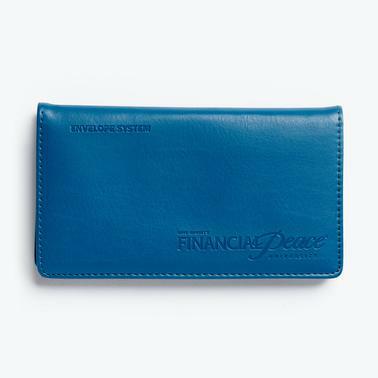 You can even fit your checkbook inside, depending on how much cash you carry! Money goes in, stress goes out. Cash in. Fill each category envelope (food, gas, clothing, entertainment, etc.) with the money allotted in your budget for the month. When it's gone, it's gone. Once you've spent all the money in a given envelope, you're done spending for that category. Don’t give in. Spend with cash when possible, and you'll be less likely to overspend or buy on impulse. Give it time. It will take a month or two to get the hang of it. Get ready to dump debt and build your family’s future!